Main Material 1)TOP:18MM THICKNESS PLYWOOD+ HPL BOARD,VARNISH THE EDGE. Hangzhou Hengfeng Furniture Co., Ltd. is located at Hangzhou, capital of Zhejiang Province, where is situated in China's Yangtze River Delta region. The company lies in North Software Park of Gongshu District Hangzhou City. And it is adjacent to Hangzhou North Bus Station and 104 State Road. The company covers a manufacturing area of 30000m2. It is specialized in designing, manufacturing and selling furniture, including dining furniture,bar furniture, school equipments, office furniture, etc. customers comes from domestic and abroad. 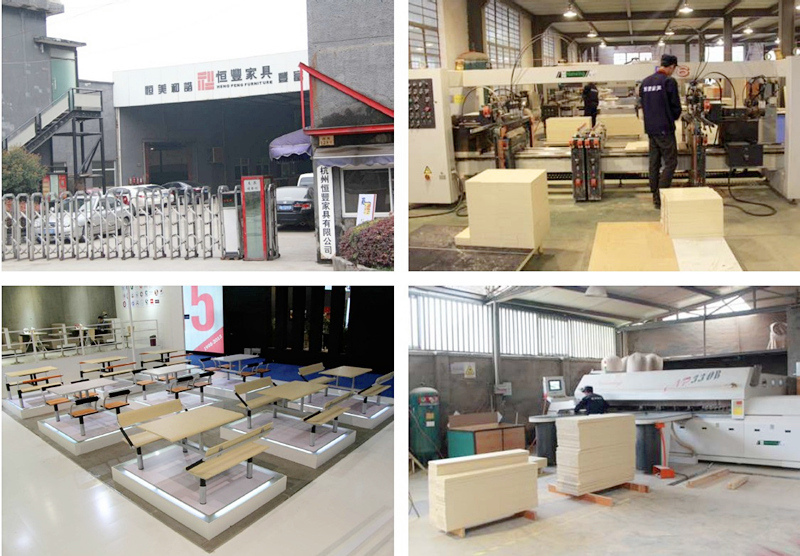 As a member of Association of China Fast Food, Hangzhou Hengfeng Furniture Co., Ltd. has been awarded the honor as "Reliable Logistical Supplier of Zhejiang Province Colleges ", "Preeminent Company of Zhejiang Province Furniture Industry", "Credit AAA Company" and so on year by year. Is has been certified by ISO9001 Quality System and ISO 14001 Environmental System, and it has gained many national patents. All the while, the company has made professional service as principle and Hengfeng as brand. Is has designed and produced a lot of modern furniture, which is widely used in schools, government departments and banks. For the sake of specialization and high quality, it sets many check points from buying original material to selling products. And the company holds a nice after-sale service system with professional installing and preparing staff to offer customers quick service. Through all Hengfeng staff's great and unremitting efforts, the brand of Hengfeng is becoming more and more well-known. Hengfeng is full of confidence to the future. It sincerely hopes to cooperate with all friends, and to realize the good will of "procedures life for ever".